Growing up I watched my parents preserve everything: tomatoes, apricots, applesauce, figs, plums–you name it. I’ve tried to follow in their footsteps. I have the equipment. I have the books. The truth is we don’t have the space to put up dozens of jars of preserves. So I make small batches of jams and pickles that go straight into the fridge. One big jar of pickles is enough to last us months. These are so, so good. Crunchy, salty, sweet, spicy, garlicky…yum. On a sandwich or sitting casually nearby… they are a great item to have on hand. Note: The pickles will need to sit in the brine for at least 4 weeks before eating. As for how long they will last… I think, to be safe, we put very short expiration dates on food, which can lead to a lot of waste. I’m not encouraging people to be unsafe, but most recipes for refrigerator pickles will probably tell you to consume them within a few weeks, maybe a month. I’ve eaten refrigerator pickles that were more than six months old and lived to write about it. We’re not talking about a chicken salad sandwich, but something immersed in salty vinegary brine. Let your eyes and nose be your guide–mold or bad smell equals compost pile. 2 lbs. 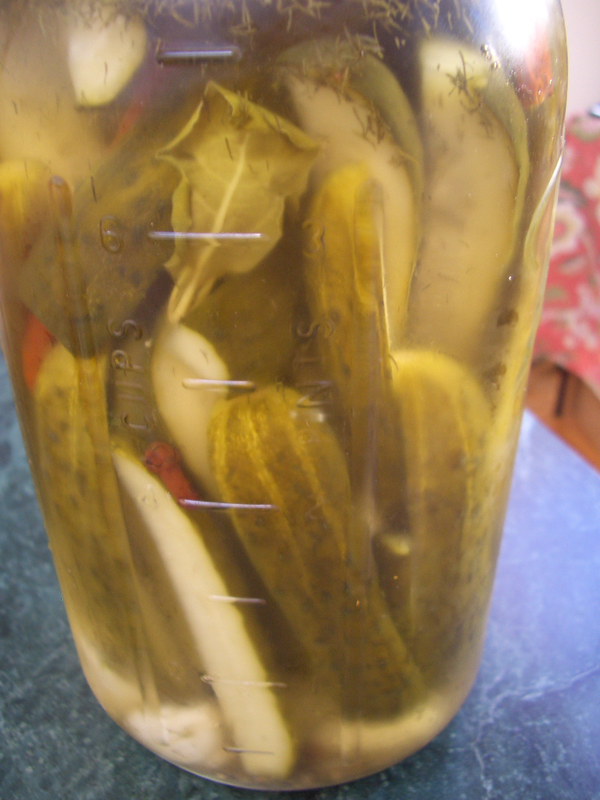 cucumbers–I used a pickle variety which are small and bumpy. Use what you can find, and if that means long cucumbers, just cut them down to size. 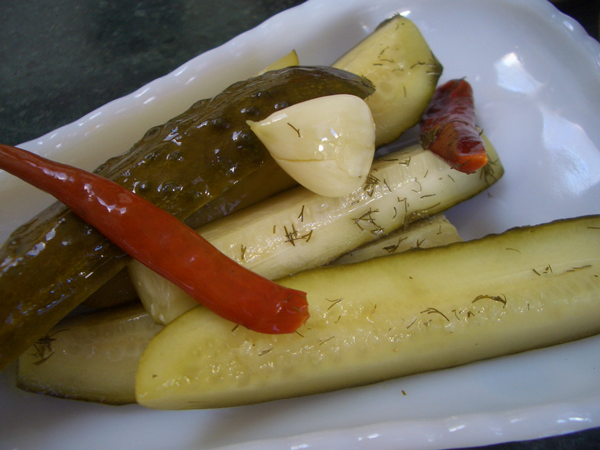 A few small pieces of fresh horseradish (optional)–the horseradish adds spice but it also keeps the pickles crisp. This is not the same as prepared horseradish in the jar. It is a root. Peel it and add a few 1 inch pieces. Wash the canning jar and lid and then sterilize them in boiling water. Use a pot large enough to immerse the jar completely. Boil for ten minutes. Remove the jar and lid with metal tongs. You’re not going to be canning the pickles in the traditional way, but sterilizing the jar will keep things fresher longer. Wash the cucumbers and cut into halves or quarters. Pack the cucumbers into the jar, evenly distributing the garlic, red peppers and horseradish as you go. In a saucepan heat the water, vinegar, sugar and salt over medium heat until the sugar and salt have dissolved. Add the rest of the herbs and spices to the brine and pour into the jar. The liquid should come almost to the rim. Cap the jar and let it cool to room temperature before putting it in the refrigerator. The pickles will be ready in about four weeks.